Getting your diet right is an important piece of the hormone jigsaw puzzle. Get of the pieces together and your testosterone levels will increase at a rate that you’d have never imagined. Some nutrients have been found to have a direct effect on male hormones, stimulating your brain to make more than enough to boost strength, muscle mass and libido. But with so many foods to choose from how do you know you’re making the best choices? In this article we take a look at the well-known aphrodisiac asparagus. 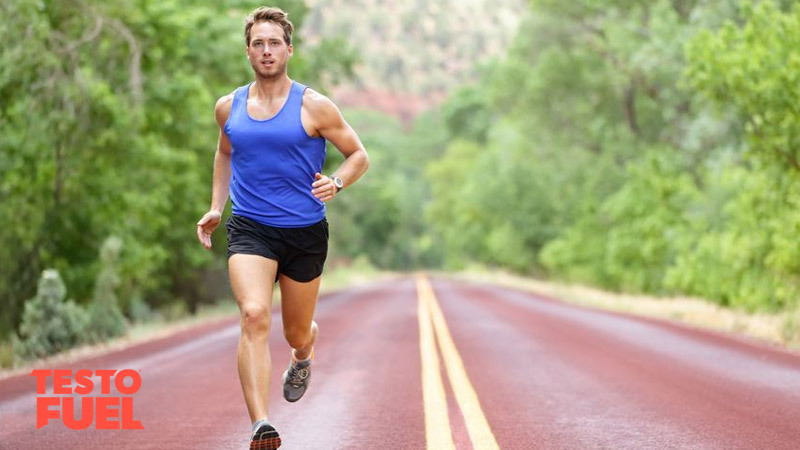 Could it be the key to the testosterone floodgates? Asparagus officinalis is a perennial plant and vegetable. It is native to Mediterranean countries but is grown throughout the world. This popular food is characterized by its fleshy and bud-like spears that lie upon a fibrous stem or spear. It has a distinct, delicate taste that is mild and earthy. Some say it tastes similar to broccoli, whereas others say it isn’t like any other vegetable and has a unique flavor that is unlike anything else. Asparagus is a vivid green color, but you can also find purple or even white varieties too. As with many vegetables, asparagus is both nutrient-dense and low in calories. You’ll find a number of vitamins and minerals in this food, including vitamins A C and E, a range of B vitamins (thiamine, riboflavin and niacin) and the minerals selenium, manganese and potassium. It is also a great source of fiber and extremely low in fat. From a testosterone-boosting point of view, the most important nutrients here are D-aspartic acid, magnesium, vitamin B6 and vitamin K.
Although there’s only a modest amount of each nutrient in the food (for example there’s only 4% of your daily magnesium needs) , it still provides a nutritionally balanced kick start for hormone production. Key Point: Asparagus is a nutrient-dense vegetable that is high in magnesium and vitamins A, B, C and E among many other vitamins and minerals. Asparagus enhances health purely based on its nutrient profile. It has strong antioxidant properties that can improve that way your cells, organs and tissues function. And that’s not just down to its suggestive shape either- its down to its nutrient profile. The ancient Greek philosopher and physician Galen celebrated asparagus for its libido-enhancing effects right back in the 2nd century. Since then it has been seen in love poetry, in herbal medicine and regularly in aphrodisiac mythology. And whilst that’s by no means a scientific rationale for the vegetable, Galen may have been onto something after all. Does Asparagus Increase Testosterone Levels? D-AA is an amino acid which has long been thought to increase both testosterone and its precursor luteinizing hormone (LH). Cooked and drained asparagus contains around 3,000 mg of the testosterone-boosting nutrient D-aspartic acid. And this nutrient has been found to boost male hormone levels in a number of studies. For example, a clinical trial published in 2012 found that supplementing D-AA for as little as 90-days helped a group of men to increase T levels by 30-60% . Not only that though, their seminal count and mobility increased between 60-100% too. As an essential nutrient, magnesium plays a pivotal role in a number of enzymatic reactions. These involve regulation of brain, muscle and bone tissue. A study published in Biological Trace Elements Research  found that 10 mg of magnesium per kilogram of body weight elevated both free and total testosterone levels in a group of martial arts fighters, even after taking part in exhaustive exercise. Typically, athletes only obtain around 70% of the magnesium they need in their diet , so supplementing with a nutrient booster is recommended. Although asparagus only contains 3% of your daily magnesium needs and still contributes towards your nutrient targets, supplementation is a more effective way of getting the right amount of magnesium and other testosterone-boosting nutrients in your diet. All of the B vitamins help you regulate and use the energy you get from food. But B6 in particular has been found to support T-building goals by lowering estrogen levels and directly stimulating testosterone production in the testes. It also plays an important role in metabolism of protein, fats and lipids, helping you to divert incoming energy to where it’s needed most. One study found that low vitamin B6 levels led to a decrease in testosterone , but supplementing the water-soluble vitamin led to reduced estrogen levels of 30% . Bearing in mind that estrogen is testosterone’s worst enemy, this is most definitely a good thing. 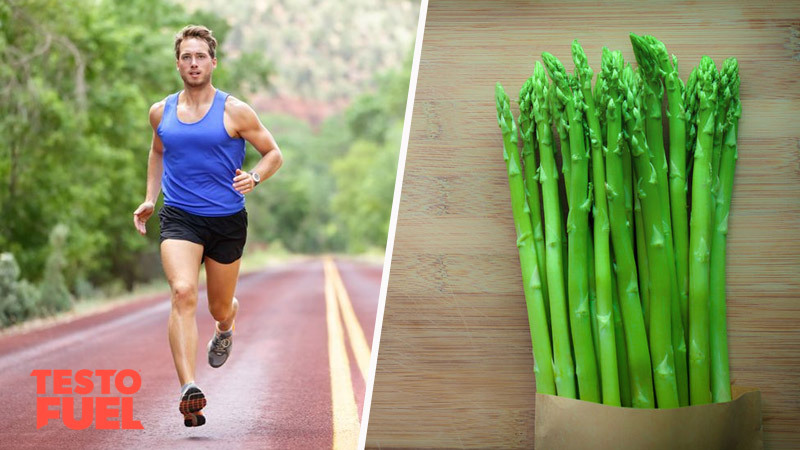 Our last asparagus testosterone-boosting nutrient is vitamin K – a fat-soluble compound responsible for regulating your vascular system. It has an inverse relationship with cardiovascular disease risk, with sufficient K2 (menaquinone) linked to long-term health improvements. As many as 80% of Americans might not be getting enough vitamin K2 in their diet, yet it has a drastic effect on testosterone levels. A recent clinical trial found that giving male rats the human equivalent of 12 mg per kg of body weight for 5-weeks boosted testosterone by an average of 56% – and by a huge 70% in some rats . That’s an impressive amount over such a small window of time. And a study published in Food & Function  found that K2 increased testosterone by boosting testicular steroidogenesis – the process by which steroid hormones are made from cholesterol. TestoFuel is an exhaustively researched, nutrient-dense testosterone booster, guaranteed to ramp up your strength, muscle mass and energy. High in D-aspartic acid, magnesium, and an assortment of other key vitamins and minerals, TestoFuel is your gateway to gains.